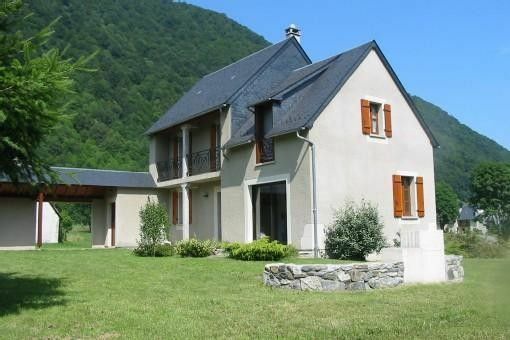 Campan, Hautes Pyrénées cottage -Comfortable house near the Col du Tourmalet. Our house is located in the Campan Valley, between the mythical passes of Tourmalet and Aspin, at the foot of the Observatory of the Pic du Midi de Bigorre. It is built in one of the most beautiful valleys of the Pyrenees, on the ruins of an authentic sheepfold. It is very nice, south facing with a sun terrace and a beautiful view of the surrounding mountains. It is surrounded by meadows and small streams, frequented by flocks of sheep and sheep in spring. It includes all current elements of comfort: central heating, fireplace, 2 bathrooms, 2 WC, 4 bedrooms (including a large dormitory), a large living room with TV and DVD player. The kitchen has a fridge freezer, a dishwasher, a microwave and a small conventional oven. It also has a laundry room with a washing machine and has a ski room in the winter, or a garden in summer. On the ground floor, a bathroom with a tub and shower. Upstairs, a bathroom with two sinks and a bathtub. Two separate toilets, a ground floor and one upstairs. Winter Activities: You are 6 km from the ski resort of 'Grand Tourmalet' which is the largest resort in the French Pyrenees with over 100 km of slopes. You can practice downhill skiing on both sides of the resort: La Mongie and Barèges side side. For cross-country skiing, you are close to the Campan-Payolle station, where you can enjoy Nordic skiing or snowshoeing in a dream setting. Summer Activities: You are in one of the high places of cycling on the key stages of the route of the Tour de France (Col d'Aspin Col du Tourmalet). You can also enjoy many walks (Néouvielle Natural Park), climbing (Cliff Trassouet), the ropes course (Gripp), fishing (Adour), paragliding (Campan), golf, Fun water games or thermal treatments (Bagneres de Bigorre). You are also close to the Marian city of Lourdes and Spain.